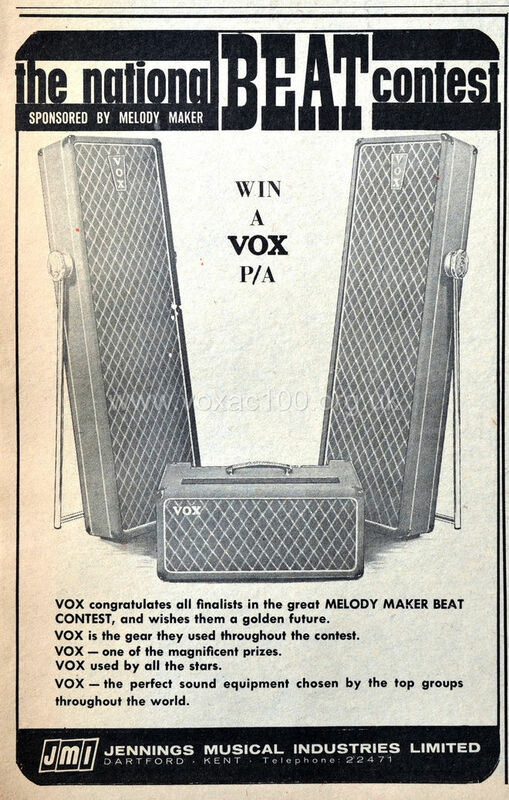 National Beat Contest, 1965 - equipment supplied by Vox. 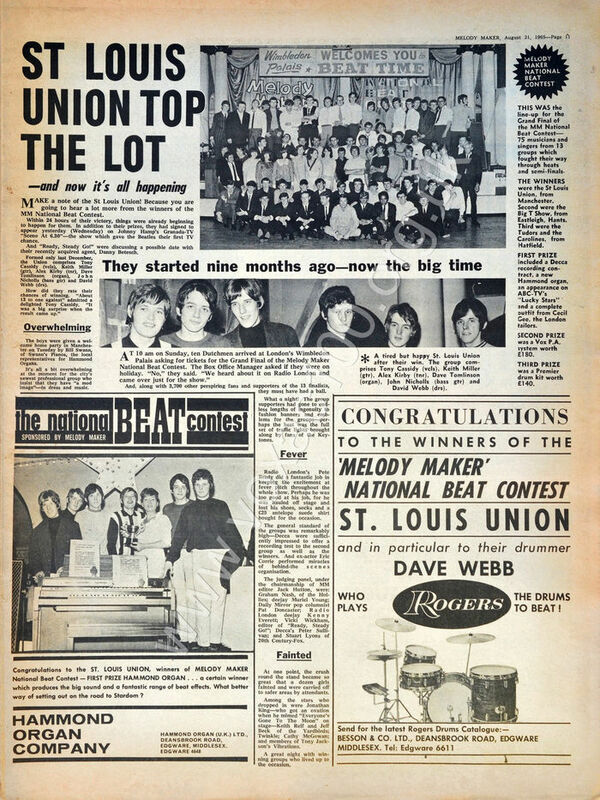 The National Beat Contest of 1964 was sponsored, somewhat incongruously, by Walls Ice Cream in conjunction with Mecca Dancing - Mecca being the owner of an extensive chain of ballrooms around the country. Heats were held at various regional venues (Southhampton, Birmingham, and so on). 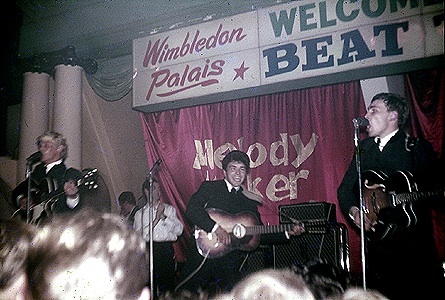 The final took place at the Lyceum Ballroom, London, on 4th May. Thirteen bands made it through. 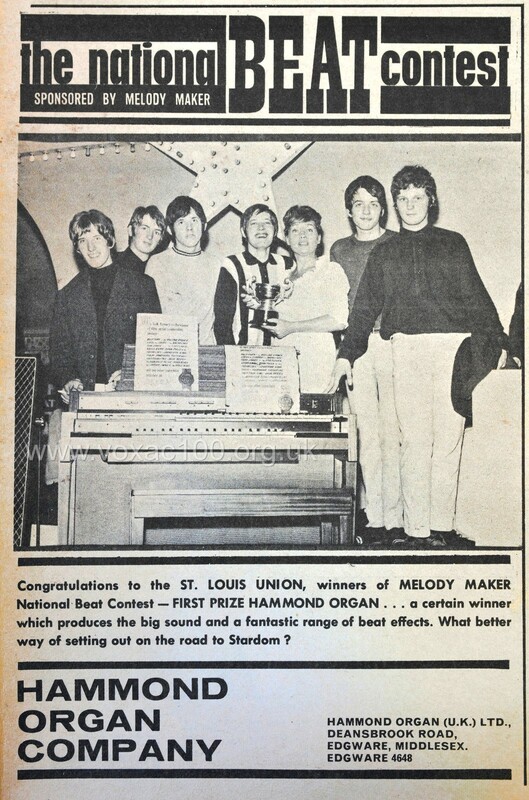 The winners were the Martin Jae Five from Croydon. 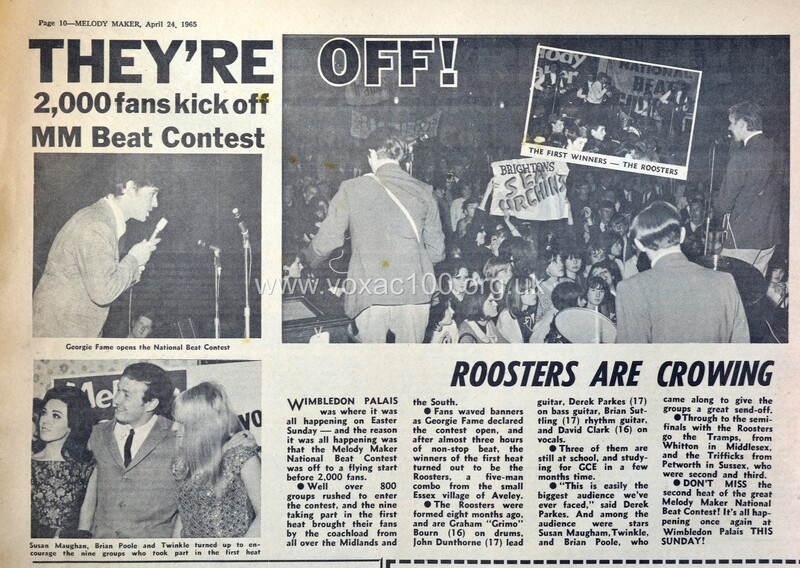 "Midland Beat", April 1964. The Birmingham heat at the Locarno Ballroom: The Plainsmen and The Salvos on stage. Note the prominence of the Walls Ice Cream sign. 1. A Decca recording contract. A new Hammond organ. An appearance on ABC-TV's "Thank Your Lucky Stars". And a set of stage clothes from the tailors Cecil Gee (later to become a chain). 2. 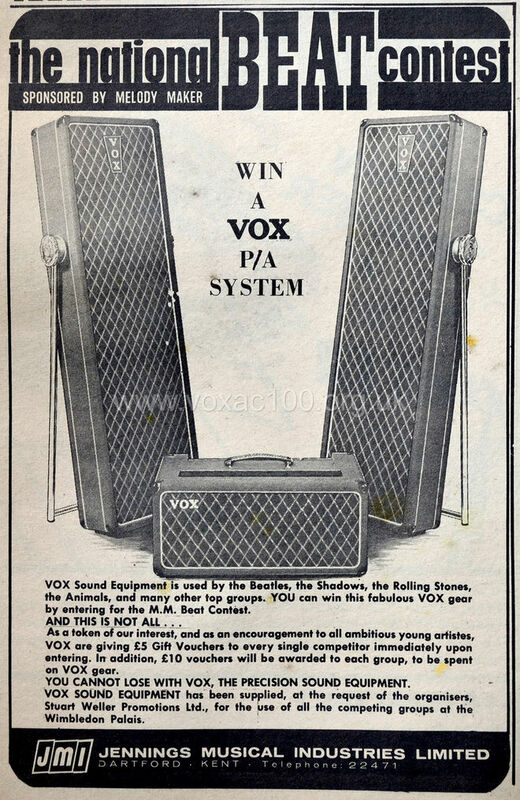 A Vox PA system worth £180. 3. A Premier drum kit worth £140. Vox also provided the equipment used by the bands throughout the contest. Whether this was simply stored at Wimbledon for the duration or brought up from Dartford on the day of the various rounds remains to be determined. 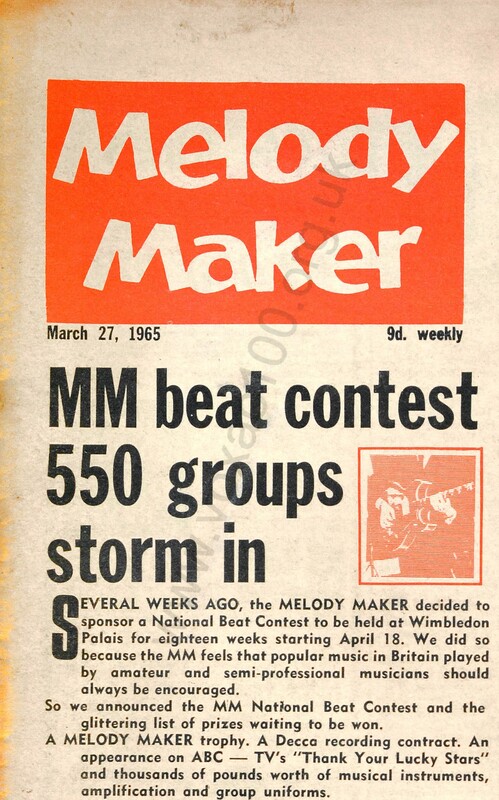 "Melody Maker", 27th March, 1965, setting out the scope of the contest. 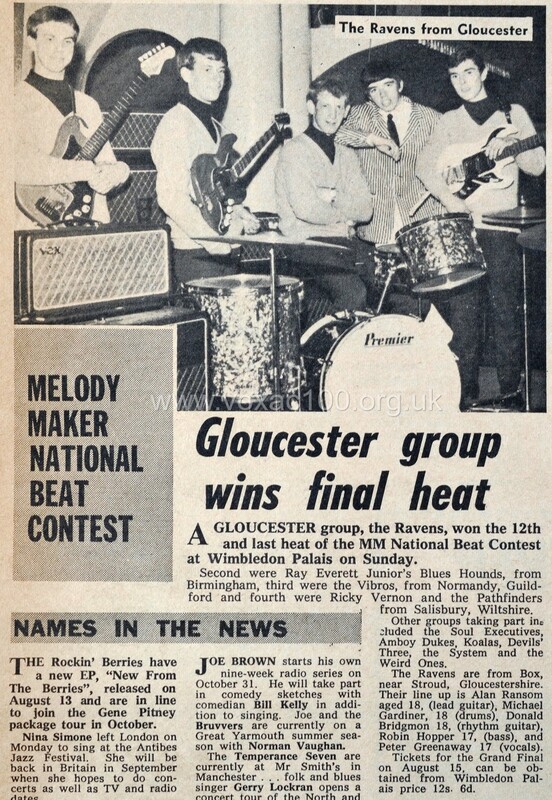 "Melody Maker", 17th April, 1965, the day before the first heat. The PA system - a large-box AC50 and two LS40 columns - was second prize (and worth £180). "Melody Maker", 24th April, 1965. 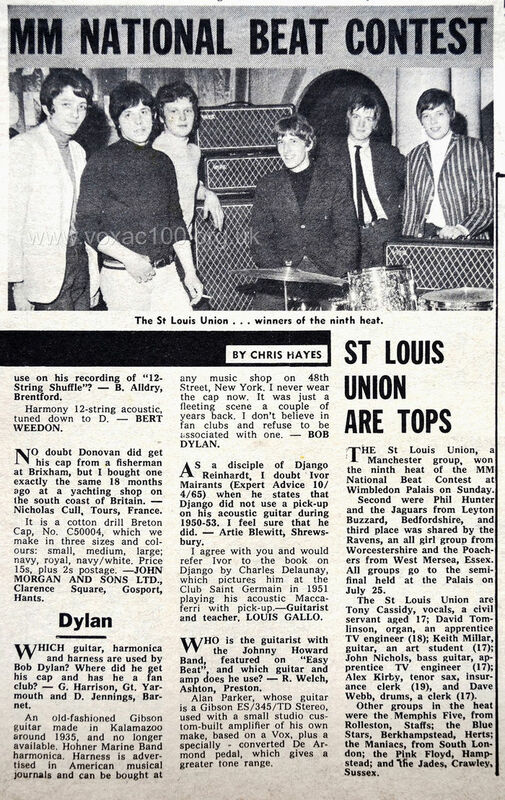 "Melody Maker", 1st May, 1965. "Melody Maker", 3rd July, 1965. 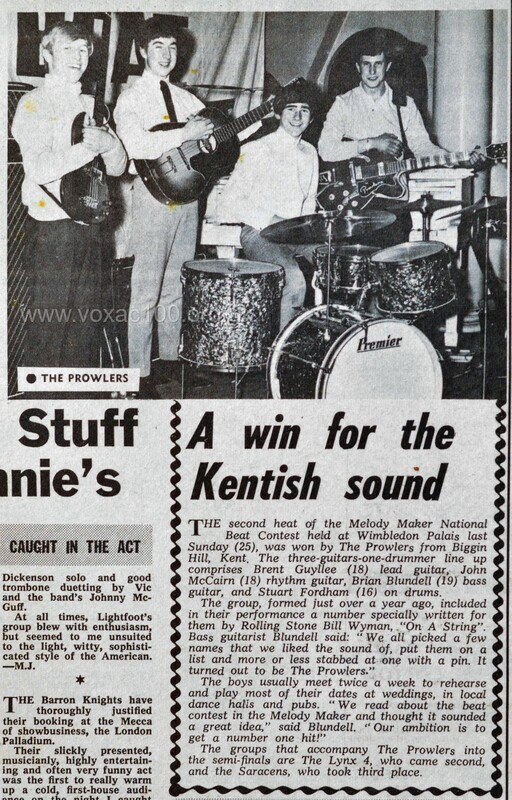 "Melody Maker", 24th July, 1965. 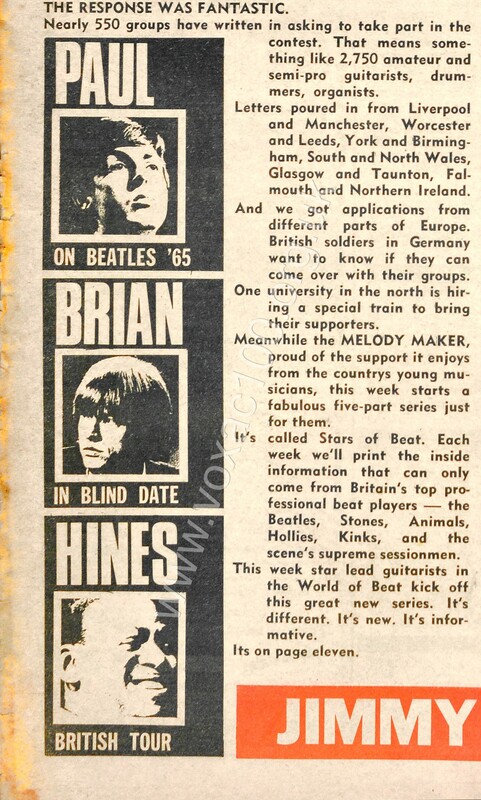 "Melody Maker", 14th August, 1965. Below, photos of "The Chevrons" taken at the final. On stage, an AC100 SDL, an AC50 Super Twin, and an AC100 bass set. The Public Address speakers are out of shot. "The Chevrons" on stage at the final. Pictures from this page. 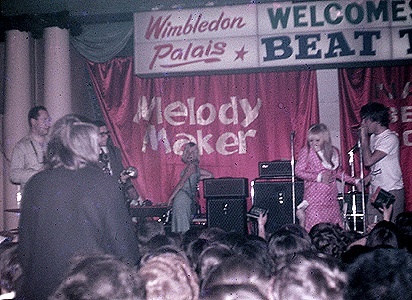 "Melody Maker", 21st August, 1965. One of the Vox columns, part of the second prize, is visible at left. "Record Mirror", 2nd January, 1965. 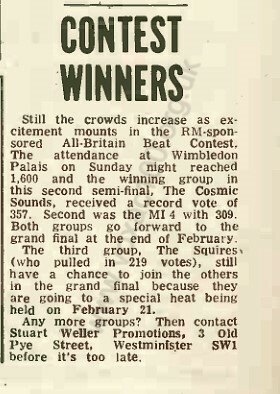 This contest was unrelated to the one sponsored by "Melody Maker".